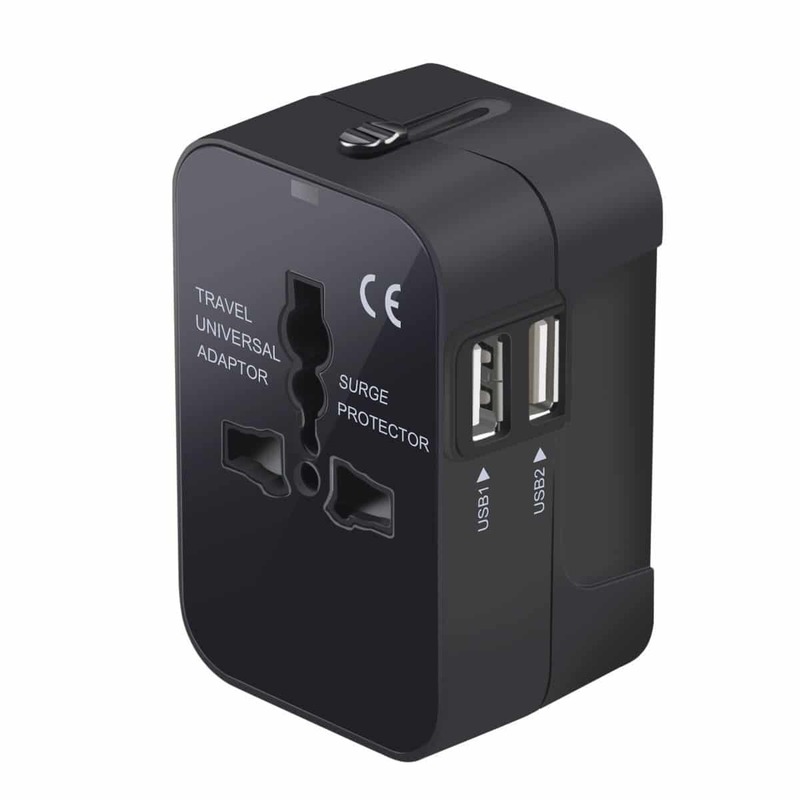 The universal plug adapter might be the most useful thing for a traveler. These are all things that we use, and that we’ve bought with our very own money. We wish we’d had people like you to buy them for us, but no such luck. Of course, we are the only crazy people in our family–the ones that travel all the time–usually with only a carry on and a backpack. And, I wouldn’t even need the backpack if I didn’t have all the camera gear. So here’s a list of stuff we actually carry in those roll-on bags (except for the knife.) Not all of it all the time, but most of it most of the time. So, if you have family or friends like us who like to travel, here’s a list of suggestions for your holiday giving. And, I’m not going to include any camera gear, except for one very cheap little thing. First the cheapest thing in the bag, and the one we always carry. Cheap disposable foam earplugs. I can’t tell you how many times we’ve needed these. From airplanes, to noisy hotel rooms, to the occasional live music show when we needed to turn down the volume, and when one of us is making some cute little noises when she’s sleeping, these are a must. I have a small zip lock bag I carry which I replenish from the big box every time we leave. Noise cancelling headphones from Bose. These are the corollary to the earplugs. They are not cheap, but good noise cancelling headphones are essential for a couple reasons. They let you drown out the airplane drone at the same time they let you listen to your music or watch a movie on the plane’s entertainment system. Be sure you get the wired version. The Bluetooth wireless version can be problematic on an airplane. A travel towel from Sea to Summit. This is particularly useful because it dries so quickly. Yeah, we know the hotels have towels, but you never know when you might need another. And, if you’re on a hike, you don’t have those fluffy hotel towels, do you? A universal plug adapter. Like the name says, it works everywhere. Coupled with a Monster travel power strip, you can plug in all your devices at once. This rugged Surefire flashlight is a professional level choice. This may be slight overkill for a flashlight. This super bright Surefire flashlight doubles as a striking weapon. (Luckily we’ve never had to use it as such.) And, you don’t need to actually hit anyone with it, because the light is bright enough to temporarily blind an attacker. As a flashlight, it can be super bright when you need it to be, or one more click will give you a softer lower intensity. Because it was designed as a striking weapon, it’s obviously super rugged. We’ve been carrying it for more than ten years. We’ve not had a problem getting it through security. Along with a flashlight, you might consider a headlamp. We like the Petzl Tikka. It’s cheap, reliable, and does the job. And, it keeps your hands free. It has three light levels, including red which is nice when you want to preserve your night vision, or not wake up your partner. We used ours all the time both in the dorm bedrooms and on the road when we did the Camino de Santiago. This is the “real” Swiss Army Knife. You need a good knife. The Swiss Army knife is standard. You know, the red ones with a cork screw. I went a little further and picked the knife that is actually used by the Swiss Army. No corkscrew, but a sturdy rugged blade, with a saw, a punch, and both sorts of screwdrivers. And you can open the main blade with one hand. These Sea to Summit dry bags come in all sizes, and if you’re doing anything where you’re likely to get wet, you need one of these. Believe me. Pick the size you need. Take it with you. And use it. Oh, and make sure you close it properly when you’re kayaking with your camera, otherwise you’re going to need a new camera. I’m speaking from experience here. As far as we’re concerned, the water bottle has two essential characteristics. It has a clip so you can attach it to your pack, and it doesn’t leak. We like a metal bottle, because it’s durable, and if you’re finicky about what you might be ingesting, it’s not plastic. If you are traveling in areas where you might have to refill from untrusted sources, you should consider this Grayl water purifier bottle, which is highly recommended by a friend who travels a lot in Africa and should know. If you have a DSLR camera, and you might be using it in the rain, you need these camera rain jackets. They’re cheap and easy to quickly slip over the camera. They have a big opening on the bottom so you can easily work the camera. And for about $7, you’re protecting your more than $1000 investment. Duh. Finally, and this is not really a gift item, but you should buy it for yourself if you do any traveling. It’s travel insurance. We like Allianz and have used them for years. We buy an annual family policy that covers us both, but there are lots of options if you don’t travel quite as much as we do. Yeah, it covers the mundane stuff like missed or cancelled flights, but why we really buy it is for overseas medical coverage and, if it’s a real emergency, medical evacuation home. We have had two friends who’ve been injured in remote locations and have had to use it. It saved them, literally, hundreds of thousands of dollars. Don’t leave home without it. We love traveling–with the right gear. You can check out a lot of the stuff we use to make all our travel much more pleasant and efficient all on one page. Click here to see it. If you purchase something from this page, Travel Past 50 will receive a small commission at no extra charge to you. Thanks. Hard to fly with that knife? It’s a good choice. Tim, If airport security is any good at all, you can’t fly with that knife in carryon. I forgot I had it in my bag just a bit ago and got caught. So, rather than lose the knife, I checked my bag. Duh on me.